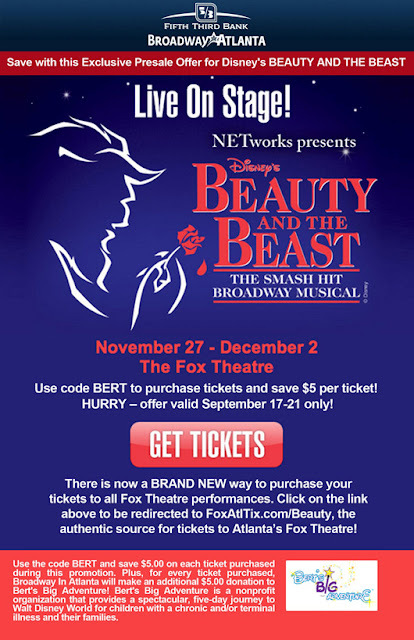 Bert’s Big Adventure has teamed up with Broadway in Atlanta for a presale offer for Disney’s Beauty and the Beast at the Fox Theater. Today through September 21, when you purchase a ticket to see Beauty and the Beast live on stage through the link below, you will save $5, and $5 will be donated by Broadway in Atlanta to Bert’s Big Adventure. Bert’s Big Adventure is currently gearing up for their annual trip to Walt Disney World with a group of chronic or terminally ill children and their families. So, join Belle, Beast and even Mrs. Potts for a magical night while supporting Bert’s Big Adventure!